The calm and clear waters of Cooper Jack Bay Beach. In addition to a nice albeit small beach, Cooper Jack Bay offers very interesting Karst limestone cave and sinkhole formations. Unfortunately, the large amounts of trash and litter present detract from what would otherwise be a scenic nature site. Sand, sea and cliffs at Cooper Jack Bay Beach. This page is for Cooper Jack Bay Beach. For the residential region, see Cooper Jack. 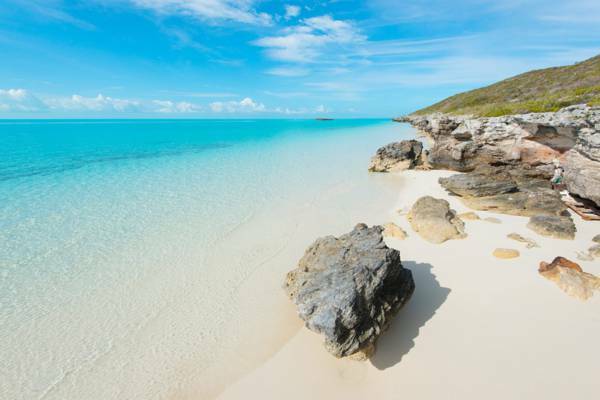 Cooper Jack Bay Beach is found off the central south coast of Providenciales. This beach is about 1000 feet (300 meters) long and is surrounded by low coastal cliffs. At high tides, much of this beach is submerged. Cooper Jack Bay is an interesting place to explore, yet from the perspective of a beach, it doesn’t offer anything over the other excellent Providenciales beaches. There’s no snorkelling here, yet the coast can be acceptable for swimming during calm conditions. Interesting flotsam and beachcombing can be found hidden between the rocks at the high tide point. There’s drift wood, bottles, fishing floats and more. An impressive view over southern Providenciales can be had from the tops of the hills above the beach, where the elevation reaches about 100 feet (30m). The tiny Cooper Jack Rock can also be seen close of the coast. Sinkhole with a natural bridge at Cooper Jack Bay Beach. The cliffs above the beach are an excellent location for exhibiting the small caves and sinkholes formed by the Karst process of dissolution. 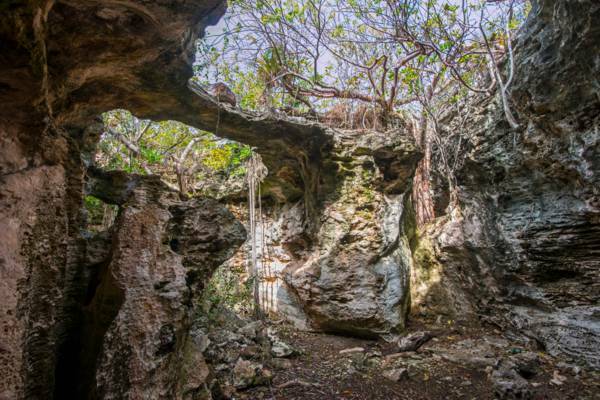 There are dozens of sinkholes and caves to be seen, ranging from tiny features to crevasses more than 30 feet (9m) deep. Some of the larger sinkholes display fascinating layers of various limestone stratification patterns. Wavy dune stratification can be seen above coastal plain bedding, which in turn is above tidal flat herringbone cross-stratification. Previously, a small nature park existed here, with paths around some of the formations and stone carvings of animals and pirates. Unfortunately, these access were neglected and the area is heavily overgrown. Due to the countless and often hidden cave features, great care should be taken when visiting Cooper Jack Bay Beach with children. Likewise, the poisonous coral sumac (Metopium Toxiferum) tree is also common to the area, and may cause skin rashes if touched. 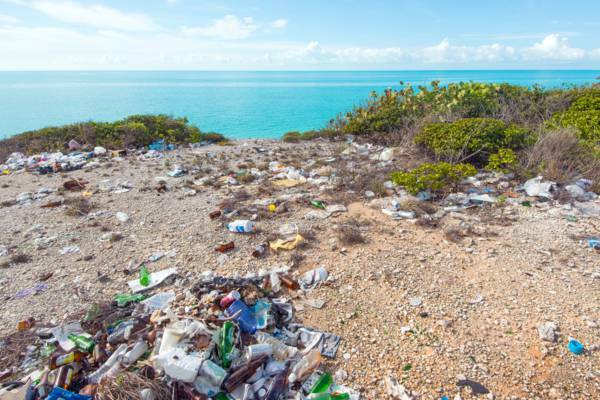 Litter at Cooper Jack Bay Beach, Providenciales. The only access to Cooper Jack Bay Beach is found near the end of Seaview Drive, off of Cooper Jack Bay Road. A footpath leads for about a 100 feet (30 meters) through the vegetation to the top of the small sea cliff with the beach below. There are no stairs to the bottom of the cliffs, yet it isn’t very difficult to climb down. Unfortunately, over the years the area has become a literal dump as lowlifes have completely saturated the location with alcohol bottles and litter, and even throw full garbage bags along the road nearby. Due to this reason, we recommend avoiding this (otherwise nice) beach.